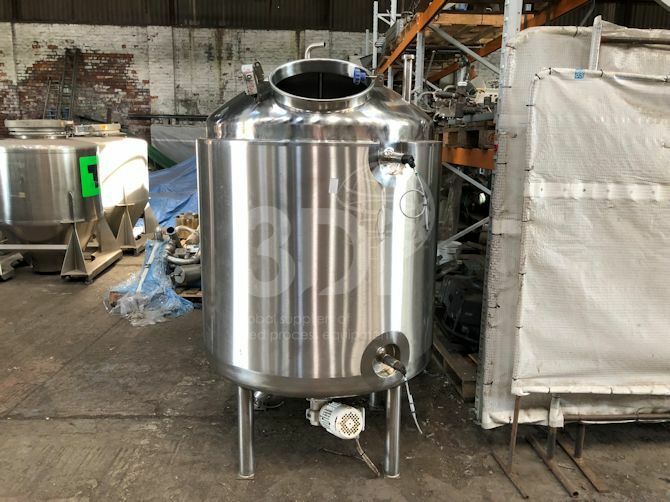 Used 1,000 Litre Stainless Steel Storage Vessel. Orientation: vertical, cylindrical, dished top and bottom. Support by (4) stainless steel legs. Dimensions: 1000mm diameter, 1100mm tank to tan, 300mm dished top, 200mm dished bottom, 2000mm overall height. RJT type connections: (1) 25mm top inlet, (1) 75mm top inlet, (1) 50mm bottom outlet, top man way. Fitted with top mounted spray ball and bottom mounted agitator. Vessel is insulated and clad in stainless steel. Previously used on food and beverages.